This is a contest that was developed to encourage new and beginning students of the saddle-making arts. If entering, your saddle will only be compared with those created by others with similar time in the trade. Entrants will receive unbiased analysis, valuable insights for improvement in basic construction and finishing of working western saddles, written score sheets with candid critiques and one-on-one Q & A with master saddlemaker judges. 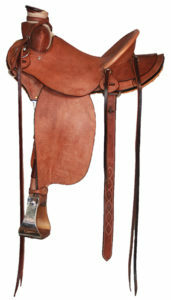 Entrants may have been practicing leatherwork for any amount of time, novice, amateur or professional, but may not have made saddles for longer than three (3) years prior to the show entered. The saddle presented for the Preview must have been created within the past 24 months prior to the start of the Southwest Leather Workers Trade Show for that year’s competition. No saddles from previous ESPs may be repeat entries. 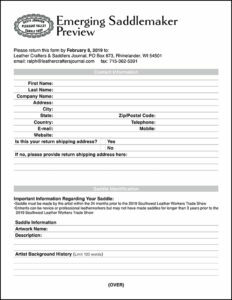 Go to www.leathercraftersjournal.com to download the registration form and complete details, or call 715-362-5393 (LC&SJ) to request a form to be sent to you by mail or email. Complete instructions are available on the registration form. All fully completed registrations must be received by 11:59 p.m., Friday, February 8, 2019, CST at the Leather Crafters & Saddlers Journal. In accordance with rules for other competitions administered by the Journal, and to remain fair to other contestants, absolutely no late entries will be accepted. The Emerging Saddlemaker Preview is held annually at the Southwest Leatherworkers Trade Show in Prescott, Arizona at the Prescott Hotel and Conference Center. Awards are presented on the Saturday of the trade show. Attendance encouraged, but not required. A $350 Cash Prize will be awarded to the maker with the most points and a $150 Cash Prize to the second place maker. Saddles may be featured in the Journal. Saddles shall remain on display for the duration of the trade show. The trade show dates and hours are: Friday, 9 a.m. – 6 p.m & Saturday, 9 a.m. – 5 p.m. & Sunday, 9 a.m. – 2 p.m. Shipped Saddles: All saddles entered into the Preview must arrive at Prescott Resort & Conference Center no earlier than Friday, February 22, 2019 (if shipping the saddle) and must be packaged in new packaging (to ensure return shipping in same packaging is viable). LC&SJ staff will re-package and return-ship the saddle according to the instructions on the registration form. Valid payment for return shipping shall be designated on the registration form. Hand-Delivered Saddles: Saddles may be checked in with LC&SJ staff at the Prescott Resort & Conference Center, on Thursday, February 28, 2019 from 12:00 p.m. until 5:00 p.m. You are encouraged to provide your own stand. Saddles must be picked up by the maker or a pre-designated person (see registration form). Pick-up begins at 2 p.m. on Sunday, March 3. All saddles shall be picked up by 5 p.m. Sunday, unless they are to be return-shipped (include packaging at drop-off). I authorize the use of my name, contact information and information (including photographs) pertaining to my saddle entered in the Emerging Saddle Maker Preview to Leather Crafters & Saddlers Journal. I do not hold Leather Crafters & Saddlers Journal responsible for my property.